Thomas Rhys Williams was born at Bundaberg, Queensland. He was an Associate of the Ballarat School of Mines (SMB) graduating as a Mining Engineer and a First Class Mining Manager in 1909. After leaving SMB Thomas Williams joined the Royal Australian Engineers in 1912. He enlisted in the 1st AIF at Perth, and served at Gallipoli, Egypt and France. An original ANZAC Williams was mentioned 9 times in despatches throughout his military career. William's immediate job at Gallipoli was to secure a water supply for the troops, which he did by sinking tube wells in Shrapnel Gully. He was in charge of water supply until 15 May when he assumed command of the 2nd Field Company. In 1916, when the Third Australian Division was formed, Williams commanded the 9th Field Company of the Royal Engineers in France, leading the company through campaigns at Messines and Third Ypres. He became commander of the 3rd Division Engineers. Thomas Rhys Williams was awarded the Distinguished Service Order (DSO), Companion or the Order of Saint Michael and Saint George (CMG) and the Croix de Guerre (Belgian). The 1917 citation for Williams' Distinguished Service Order states: "Major Williams was recalled to Australia from Egypt, specially to train Engineers, and to raise a new Field Company, which he has brought to a high state of efficiency. He also rendered the great assistance to the other Field Company Commanders in their tasks of training their Units. He has repeatedly shown organizing ability of a high calibre, both in preparations for raids and in the general conduct of the work of the Brigade to which his Company is affiliated in the line. His unfailing devotion to duty at ANZAC, recognised by his name being mentioned twice in despatches, is no less in evidence here in France." Serving his Country once again during World War II Thomas Rhys Williams was Master-General of Ordinance from 1939 to 1940, then Chief Military Advisor to the Director-General of Munitions in 1941. Williams retired in 1944, serving his country yet again as Australia's representative on the Imperial (now Commonwealth) War Graves Commission. Thomas Rhys Williams died on 23 October 1950. This biography compiled by Clare Gervasoni, April 2009, with thanks to the research of Anne Long. Back (left to right): W. Smith, L. Seward, L. Coulter, T. WILLIAMS. 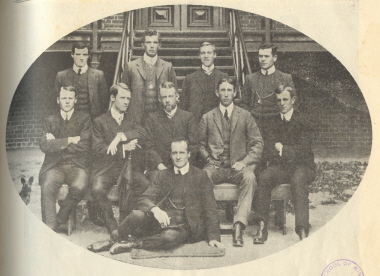 Seated (left to right): F. Treloar, Mr Whitington, Thomas Hart, O.W. Williams.